This Investigation is devoted to the search for new effective anticancer drugs, which is one of the priority areas of medicine. Effect of extracts of maize anthocyanin and Gratiola officinalis drug was studied by using morphological and biochemical methods in experiments in vivo on 30 laboratory rats with transplanted liver cancer PC-1. It was found that an extract of Gratiola officinalis has selective cytotoxic and cytostatic effects on tumor cells. Zea mays extract reduces endogenous intoxication, but its effect on the tumor requires further study. Navolokin NA, Polukonova NV, Maslyakova GN, Bucharskaya AB, Durnova NA. Effect of extracts of Gratiola officinalis and Zea mays on the tumor and the morphology of the internal organs of rats with transplanted liver cancer. Russian Open Medical Journal 2012; 1: 0203. Toxic effects on normal tissues and organs of the body and the development of tumor resistance to them are serious faults of various synthesized drugs with antitumor activity . It constantly stimulates the search for new, safer and highly effective drugs. Recently, more attention is paid to non-toxic or slightly toxic herbal product for cancer therapy that can be used for the prevention of tumor, and for protection of normal cells during standard chemo-and radiotherapy. There is special interest to combination of alkaloid and flavonoid-containing components in creating of anticancer drugs. Flavonoid-containing components with anticancer and antioxidant activity protect cell membranes and reduce the toxic effects of alkaloid-containing compounds [2-5]. Objective: to investigate the antitumor activity of flavonoid-containing extracts of Zea mays and Gratiola officinalis medicine and their impact on the internal organs, tumors and blood of rats with transplanted liver cancer PC-1 in experiments in vivo. Aqueous solutions of dry plant extracts: Gratiola officinalis and anthocyanin corn (Zea mays) were received in a certain way, providing a maximum output only non-toxic compounds (flavonoids) and the lack of access of toxic compounds (alkaloids, glycosides, etc.) . Male white laboratory rats weighing 150 ± 50 g were used in the experiment, 0.5 ml of 25% tumor suspension of alveolar liver cancer strain in Hanks' solution were implanted them subcutaneously in the shoulder. Strains of transplanted tumors derived from Russian Cancer Research Center n.a. N.N. Blokhin of Russian Academy of Medical Science. Animals with transplanted liver cancer were randomly divided into 3 groups: 10 rats received an extract Gratiola officinalis at dosage 110.88 mg/kg, 10 rats received an extract of corn Zea mays at dosage 637.58 mg/kg and 10 rats of the control group (without extracts). The solution is administered orally to animals in the experimental groups in appropriate dosages every two days for three weeks after tumor transplantation. Futher observation of the animals was carried out for a week without administration of the extract. Dynamic growth of grafted tumors was assessed by changes in the volume of liver cancer. Measurements were made with a caliper every two days from the start of the experiment and the tumor volume was calculated by the formula V = A x B x C, where A – width, B – thickness, C – height of the tumor. On the 26th day the animals were taken out from the experiment and tissue samples of tumors, blood for morphological and biochemical studies were collected. 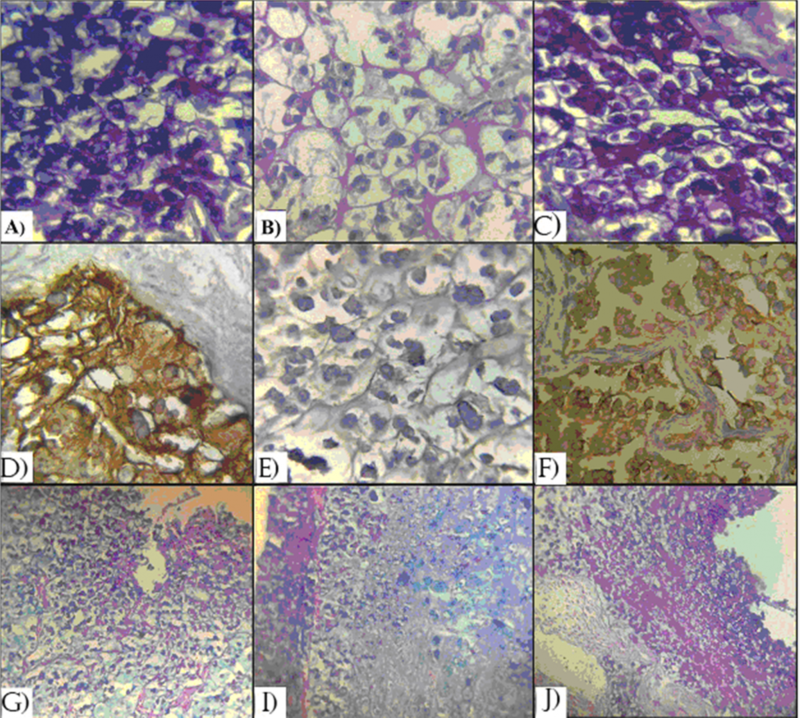 Morphological and morphometric methods were used for the study of tumor pathomorphosis and structural changes in the organs by using standard histological techniques with hematoxylin and eosin staining, Romanovsky-Giemsa, histochemical techniques: PAS-reaction (dyed mucopolysaccharides), the color on the wheat germ agglutinin (WGA), as well as the color of methyl green pyronin by Brachet for detection of DNA and RNA. The presence of dystrophic and necrobiotic changes and cytomorphological parameters: the diameter of a cancer cell, the diameters of the cancer cell and its nucleus, the nuclear-cytoplasmic index take into account to assess pathomorphosis of tumor. Counting was performed in 10 fields of view of each micropreparation. Standard biochemical methods were used for the analysis of antioxidant activity: determination of malonic dialdehyde (MDA) using the thiobarbituric acid, determination of catalase activity in red blood cells, determination of blood superoxide dismutase (SOD). Leukocyte formula of blood was analyzed for the following parameters - number: sticks, segments, basophils, monocytes, lymphocytes, which was calculated an index of endogenous intoxication by Kal-Khalifa in the modification of B.A. Reis et al [10, 11]. Work with laboratory animals was conducted according to study protocol and Geneva Convention of "International Principles of biomedical research using animals" (1985). Theme and descriptions of experiments were approved by the ethics committee of Saratov State Medical University n.a. V.I. Razumovsky. Statistical analysis of the results was obtained using the program «Statistica 6.0». Processing of the results was carried out by conventional methods of biomedical statistics and computing the average deviation from the mean, the significance of differences in the parametric distribution was determined by t-test. Dynamics of tumor growth in the group of rats treated with extracts showed slowing down of tumor growth in a week by 2.5%, after two weeks by 28% compared with the control, and after three weeks by 41%. After four weeks, at the end of experiment the retardation of tumor growth was less pronounced by 15% compared to controls, which may be due to the cessation of extract administration (Fig. 1). Analysis of tumor growth in the group of rats treated with the extract of corn showed, on the contrary, acceleration of its growth in a week by 61%, after two weeks by 115%, after three weeks by 59% and by the end of the experiment by 22% compared with the control group. Figure 1. A clear zone of necrosis in liver cancer in the group of animals treated with the extract of Gratiola officinalis. Stained with hematoxylin and eosin. M. x100. In the control group transplanted tumors composed of lobules of various sizes which separated by thin layers of connective tissue. Tumor cells were oval-round and had eccentrically located nucleus. A significant part of the cytoplasm was occupied by large vacuoles containing mucus. In the same field of view cellular elements with mucous vacuoles of various sizes were marked. The nuclei were usually round or bean-shaped in cells with small eccentric vacuoles. The nuclei have been pushed back to the cell periphery in cells with large vacuoles in the cytoplasm, and such cells resembled in their structure annular cells of mucus cancer. Single mitoses were identified. Congestion of the mucous masses was found in small foci of necrosis, along with fragments of broken cells. Slimy masses were also present in the intercellular spaces. The tumor retained the same structure in the group of rats treated with extracts of Gratiola officinalis and corn as described in the control group. However, reduction of mucus component and the development of atrophic and degenerative changes in the tumor cells were noted compared with the control, as evidenced by the appearance of cell-type "cells of Shadows". 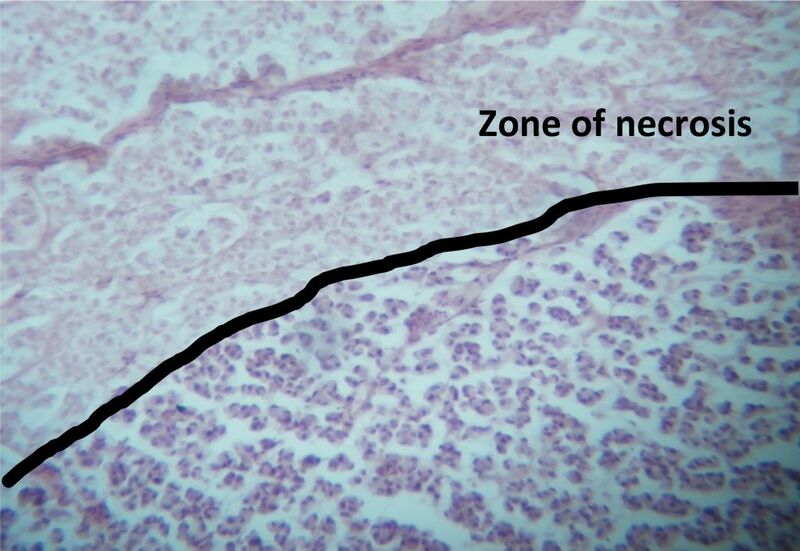 The appearance of clear zones of necrosis and no mitoses were found in the tumor tissue (Fig. 1). During histochemical staining of tumor with wheat germ lectin WGA (stains on glycoproteins) and PAS-reaction (dyed mucopolysaccharides) a significant reduction in the intensity of color in group of animals treated with extract of Gratiola officinalis was noted compared to the control, indicating the damage to the surface of cell membranes. Pronounced staining of tumor tissue was found in the group of rats treated with the extract of corn, as well as in the control group (Fig. 2). Figure 2. Histological changes in tumor animal groups. PAS-reaction: A) Control, B) Gratiola officinalis, C) Corn, WGA, D) Control, E) Gratiola officinalis, F) Corn, methyl green pyronine by Brashe, G) Control, I) Gratiola officinalis, J) Corn. After histochemical on DNA and RNA by methyl green pyronin by Brashe the decrease of color intensity on RNA was observed after administration of Gratiola officinalis extract, indicating a reduction in transcriptional activity in the cells of liver cancer. In contrary, more pronounced color intensity of methyl green pyronin was detected in the group of animals treated with corn extract compared with the control group, indicating the increasing of the transcriptional activity. It should be noted that the most pronounced tumor pathomorphosis was observed in the central regions of liver cancer in the experimental group of animals treated with the extract of Gratiola officinalis. At morphometric study in the group of rats treated with Gratiola officinalis diameter of tumor cell nuclei was 3.40 ± 0.15, which is 13.5% less than the diameter of cell nuclei in the control (4.05 ± 0.15). In the group of rats treated with corn extract nuclei diameter (4.07 ± 0.15) was not significantly changed. The diameter of the cells in the group of rats treated with Gratiola officinalis (5.03 ± 0.22) was significantly reduced by 32.7% compared to the diameter of the cells in the control (7.45 ± 0.15), in the group of rats treated with corn extract cell diameter was less then 21% compared to controls (5.90 ± 0.15) (Table 1). The values of the nuclear-cytoplasmic index (NCI) under the extracts were increased in comparison with controls. The resulting differences were significant at p<0.05. At histological studies of animals fed extracts there were no changes in the brain, heart, lungs, intestines in comparison with the control, and only in the liver hepatocytes dystrophy was more pronounced in the group of animals treated with the extract of Gratiola officinalis. Number of segmented neutrophils was decreased by 22.3% (after administration of Gratiola officinalis) and 24.5% (after corn administration). Lymphocyte count was increased by 55% (after administration of Gratiola officinalis) and 46% (after administration of Gratiola officinalis), which may reflect the inclusion of specific immune mechanisms of organism defense, as well as the possible activation of antitumor immunity (Table 2). The resulting differences were significant at p <0.05. Indicator of lipid peroxidation (LPO) and antioxidant (AO) activity of enzymes were not different from the control group (Table 3) in the experiment with the extract of corn, indicating a weak performance AO systems of cells in this type of tumors. MDA increase by 171% relative to the control was observed in the experiment with Gratiola officinalis extract, indicating that the destruction of red blood cell membranes under the influence of the lipid peroxidation products. AO enzyme activity was also increased: catalase – by 111%, superoxide dismutase – by 59% (Table 3), which indicates a high AO activity of the extract of Gratiola officinalis. At study of the endogenous intoxication degree there was found that the animals in the control group had a high endogenous intoxication due to the development of tumor, after action of extracts - the level of intoxication decreased 2.5 times, corresponding to the values of moderate toxicity (Table 4). Reducing the level of intoxication may be due to the presence of flavonoids in both extracts. We revealed atrophic and degenerative changes in the tumor cells and the appearance of clear zones of necrosis in tumors, reduced the color intensity of glycoproteins and mucopolysaccharides by the action of the extract Gratiola officinalis and the absence of marked changes in the organs of laboratory animals, which were evidenced of selective cytotoxic effect of the extract on the tumor cells. The appearance of necrosis in the tumor in group of animals treated with corn extract seems to have a different genesis: insufficient vessel growth does not provide adequate nutrition of the tumor. In the group of animals treated with the extract of Gratiola officinalis significant decrease of cell diameter and the diameter of the cell nucleus was recorded compared to the control group. There were no morphological signs of loss of differentiation and atypia of tumor cells. Along with the absence of mitosis the reducing of the size of the nucleus and cytoplasm of cancer cells as well as low levels of RNA in tumor cells of rats treated with Gratiola officinalis indicates a low mitotic activity of tumor cells and inhibition of the cell cycle during the S-and G2 – phases with subsequent reduction of cell proliferation. It generally evidences the cytostatic effect of biological active composition of Gratiola officinalis extract. This effect of Gratiola officinalis also confirms a significant slowing of tumor growth in comparison with the control group. Reducing of cytometric indicators of cancer cells under the influence of corn extract due to more rapid and intense growth of the tumor and, therefore, highly proliferative activity of cells, as was evidenced by higher levels of RNA and no decrease in the size of the nucleus. Therefore, the extract of corn has a stimulating effect on tumor growth. Increase of the antioxidant activity of Gratiola officinalis extract at growing tumor serves as a protective mechanism that reduces the toxic effect. Along with increasing of lymphocytes in the blood, it indicates the inclusion of immune mechanisms of defense, and particularly the possible activation of antitumor immunity. Extract of Zea mays had no expressed antioxidant activity. Our results suggest a positive effect of the Gratiola officinalis extract on animals with transplanted liver cancer and adverse effects on the tumor cells, which were manifested in the form of both cytotoxic and cytostatic effects, and it opens the prospect of studying of Gratiola officinalis extract in various experimental models. Extract of Zea mays may be promising for the development of drugs that reduce the endogenous intoxication, but its probable application in antitumor treatment requires further experimental studies. Korman DB. Fundamentals of anticancer chemotherapy. Moskow, Russia, 2006. 512 p [Text in Russian]. Vladimirov Y, Azizov OA, Deev AI, Kozlov AV, Osipov AN, Roshchupkin DI. Free radicals in living systems. Results of science and technology. Biophysics Итоги 1992; 29: 3-250 [Article in Russian]. Navolokin NA, Pavlova AV. Morphological changes in the muscles of laboratory rats and determination of toxicity when administered extract Hauran. Bulletin of Medical Internet Conferences 2012; 2(2): 82 (URL: http://medconfer.com/node/1446) [Article in Russian]. Navolokin NA Andreeva, Rykalina EB, Baytman TP, Polukonova NV. About mechanism of antitumor action of plant extracts. Proceeding of Scientific-practical conference "Modern medicine and pharmaceutics: Analysis and Prospects for Development", Moscow, Russia, Jan 2012: 21-23 [Article in Russian]. Navolokin NA, Polukonova NV, Kong XM, Bucharskaya AB, Maslyakova GN. Effect of flavonoids containing extract on the laboratory rats with liver tumors entwined PC-1. Proceeding of Conference “Novel Drugs Based on Plant Substances”, St. Petersburg, Russia, May 2011: 290-291 [Article in Russian]. Polukonova NV, Durnova NA, Raykov SV, Fedorov IA, Razuvaeva KA, Shcherbachenko AV, Almyashev RS. Analysis of the chemical composition and biological properties of the alcoholic extract of plant material hybrid form of maize Zea mays L. Proceeding of IV All-Russian Conference "Farmobrazovanie 2010", Voronezh, Russia, 2010: 306-311 [Article in Russian]. Maslyakova GN, Bucharskaya AB, Navolokin NA, Shirokov AA, Burov AM. Application of morphological studies in nanoonkologii. Russian Journal of Biotherapy 2011; (4): 104 (URL: http://www.ronc.ru/files/36780/rbj-4-2011inet.pdf) [Article in Russian]. Gelfandbeyn JA, Kaplan BL, Maerovich IM. Nuclear-cytoplasmic constant malignant structures. Experimental surgery and anesthesiology 1973; (3): 3-9 [Article in Russian]. Artyukhov VG, Nakvasina MA. Biological membranes. Structural organization, function, modification of physical and chemical agents. Publishing House of the Voronezh State University, Voronezh, Russia, 2000. 243 p [Text in Russian]. Kalf-Calif YY. About leukocyte index of intoxication and its practical significance. Medical work (Vrachebnoe delo) 1941; (1): 31-33 [Article in Russian]. Reis BA, Poluektov LV. Isolation of toxic polypeptide average molecular weight in the experimental diffuse peritonitis. Bulletin of Experimental Biology and Medicine 1983; (7): 53-55 [Article in Russian]. Natalya A. Durnova – D.Sc., Professor, Head of the Department of General Biology, Botany and Pharmacognosy, Saratov State Medical University n.a. V.I. Razumovsky, Saratov, Russia. © 2012, Navolokin N.A., Polukonova N.V., Maslyakova G.N., Bucharskaya A.B., Durnova N.A. Received 25 August 2012, Accepted 10 September 2012. Bucharskaya, Alla B. - Durnova, Natalya A. - Maslyakova, Galina N. - Navolokin, Nikita A. - Polukonova, Natalya V.